﻿ All-in-one converter – KONČAR Elektronika i informatika d.d. European Railway Review, the leading bi-monthly technical journal for the European rail industry, has published an article about KONČAR All-in-one traction converter. 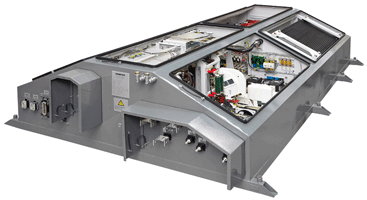 The converter is updated and improved version of the KONTRAC GP 550 DE , but both propulsion and auxiliary supply equipment as well as cooling system are integrated into a roof-mounted converter box, while a high degree of functional integration as well as maintenance cost optimized design are realized. The increased power density of this converter enables compact and light-weighted vehicle design.